This is a boargame to practice PRESENT CONTINUOUS. Students are supposed to use dice and movers to go though the boardgame. 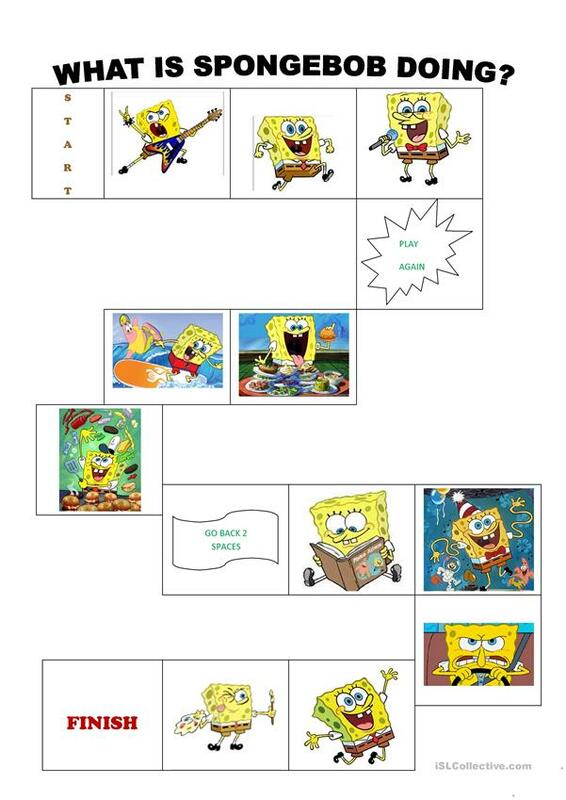 They have to say what Spongebob is doing in each box. The above downloadable worksheet is recommended for elementary school students and kindergartners and nursery school students at Beginner (pre-A1) and Elementary (A1) level. It is a useful material for practising Present continuous (progressive) tense in English, and can be used for working on your pupils' Speaking skills. It features the topic and words of Actions. tatinaider is from/lives in Brazil and has been a member of iSLCollective since 2010-06-15 22:31:36. tatinaider last logged in on 2013-05-08 22:45:25, and has shared 6 resources on iSLCollective so far.